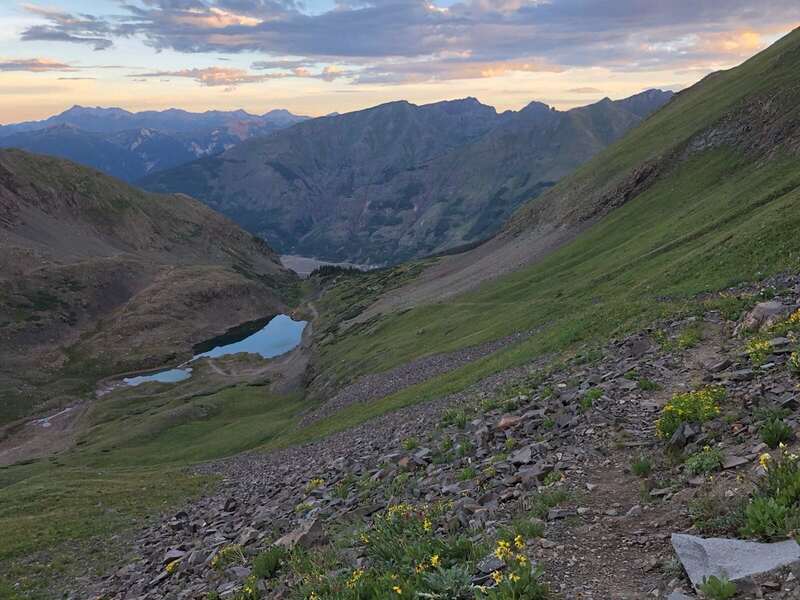 The 25th edition of the Hardrock 100 took place on July 20th to the 22nd, 2018 in the San Juan Mountains of Colorado under the Rocky Mountains’ typically tempestuous monsoon-season skies. 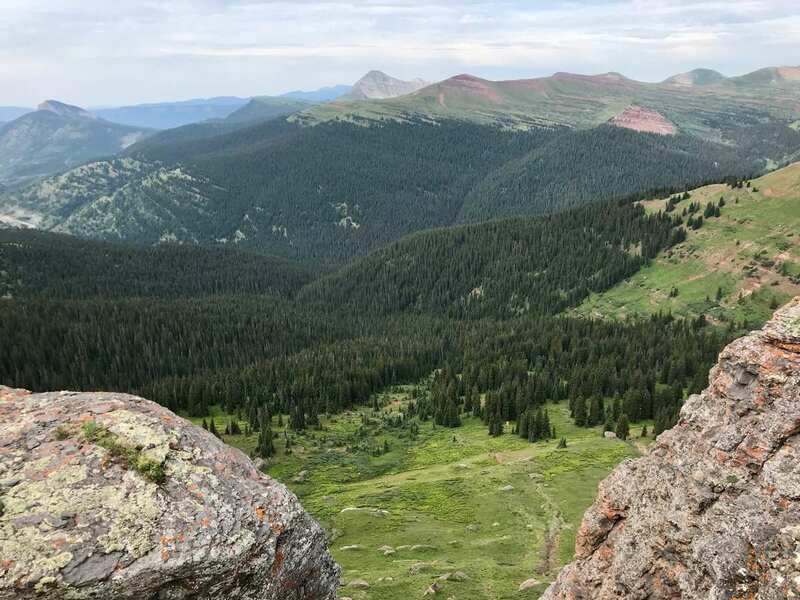 Event participants had 48 hours to traverse the 100.5-mile loop made up of dirt roads, old mining trails, singletrack, and game trails at an average altitude of 11,000 feet and accumulating 33,000-plus feet of climb. The run switches direction each year, and ‘even’ years like this one bring about the clockwise direction of travel. In the women’s race, Sabrina Stanley (pre- and post-race interviews) ran gutsy and off the front to take home the women’s win in her debut at the event. 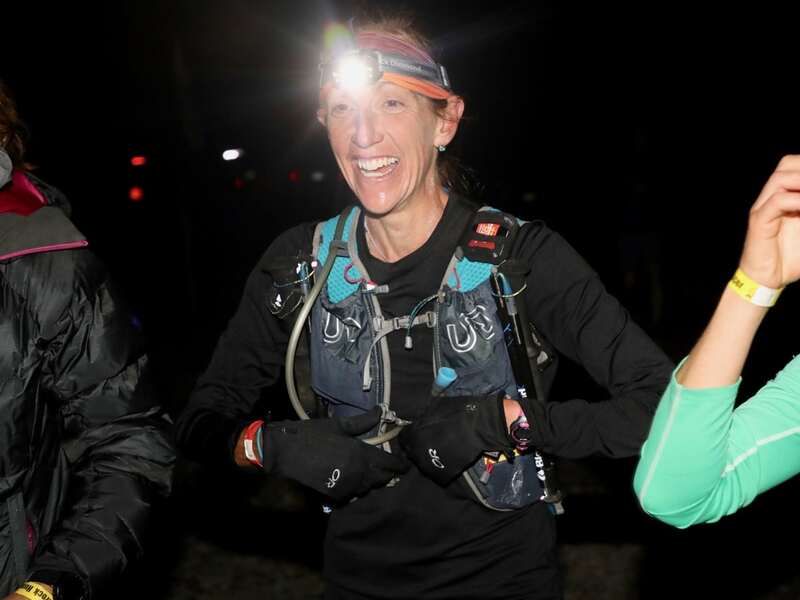 She was followed by ultrarunning icon Nikki Kimball (pre- and post-race interviews) in second place, who was also debuting at Hardrock. After relatively calm but warm weather for first 36 hours of the event–save for a brief storm about 14 hours into the race that only a few leaders experienced–violent thunderstorms filled the skies above the final 20 miles of the course for about two hours on the second evening. A dozen or so participants hunkered down in the lowest places they could find during them, and all made it through safely. Australia’s Andy Hewat was the year’s final finisher, crossing the line in 47:56:14, with this finish his fifth at Hardrock. Thanks also to GU Energy Labs and Altra for their support of our Hardrock coverage. To get all the latest ultrarunning news from iRunFar.com, subscribe to our daily email updates or our RSS feed. Like what we’re doing? Please consider becoming a monthly supporter of iRunFar on Patreon or making a one time donation via PayPal in support of our coverage of the Hardrock 100. We’ve also got from great products in the new iRunFar Store! Your support helps make iRunFar happen. Thank you! France’s Xavier Thévenard (pre-race interview) raced from the word ‘go’ and was out in front of the men’s field as early as a half mile into the event. From the start until roughly at Telluride, mile 28, Thévenard not only traveled alone and way in front of the rest of the men, but also at under course-record pace. On the long climb out of Telluride to the iconic Kroger’s Canteen, nestled in a tight pass at over 13,000 feet in elevation, Thévenard’s pace settled into what was certainly fast for the Hardrock course, but slower than record pace. Even so, his lead on the men’s field continued to increase, such that at Sherman, mile 72, he was more than 90 minutes ahead of anyone else. Thévenard arrived at the Cunningham aid station, mile 91, at the race’s lead, too. However, at Cunningham, Thévenard was disqualified after discussions with the race organization about a confirmed rules breach back before the course’s halfway point, two miles after the Ouray aid station, mile 44, where he was aided by his crew with ice and water, which is disallowed by the event’s rules. After the event, race director Dale Garland told iRunFar that following a bystander report of a possible rules breach, the organization researched what happened, asked questions of both Thévenard and his crew at three different aid stations–two of these interactions were observed by iRunFar–and conferred with the organization’s rules committee before the incident’s culmination in Cunningham Gulch. Post-event, Thévenard told iRunFar that he, indeed, admits to taking aid outside an aid station, but that he felt the disqualification was a disproportionate penalty for the rule he broke. Tony Russ was the bystander who reported the rules breach to the race organization, and he told iRunFar after the event that he observed Thévenard receiving aid in the form of water to drink and his crew members doing something with his pack. As all this happened, Jeff Browning (pre– and post-race interviews), who had run in second place nearly the whole day (and night), went through the Maggie Gulch aid station, mile 85, thinking he was, indeed, in second place. However, when he arrived to Cunningham a bit later, he found himself at the head of the race. Not only that but second-place Jeff Rome (post-race interview) was hot on his heels, leaving the Cunningham aid station just 6.5 minutes behind. The gentlemen could both see the other and hear the small gathered crowd’s early morning cheering for both of them. A race of the Jeffs was on. But we should back up, say, 91 miles. As early as the Mineral Creek crossing, mile 2, Jeff Browning crossed in second place with a long tail of men trailing him. This pattern continued for miles, with what looked like Browning doing his thing and that thing amounting to him essentially leading the men’s chase pack. While he mostly looked at ease in his effort, he would later say that he both felt the fact that he ran the Western States 100 just four weeks ago and that he struggled with motivation because he couldn’t make up time on the lead. After the race, he also said he got confused for a spell in the vicinity of Cataract Lake, mile 75, when he couldn’t see course markings and wandered back and forth for a bit. His GPS tracker indicates his wanderings amounted to perhaps 2.5 extra miles. Browning eventually encountered Troy Howard (pre- and post-race interviews) who was at the time in third place, approaching from behind. Together they sorted his confusion, and headed on. Browning said he surged in the miles following his encounter with Howard to gain a new gap. Jeff Rome turned heads at Hardrock last year when he finished in seventh place in 28:53. He would say after the race that his goal this year was to run under 28 hours. 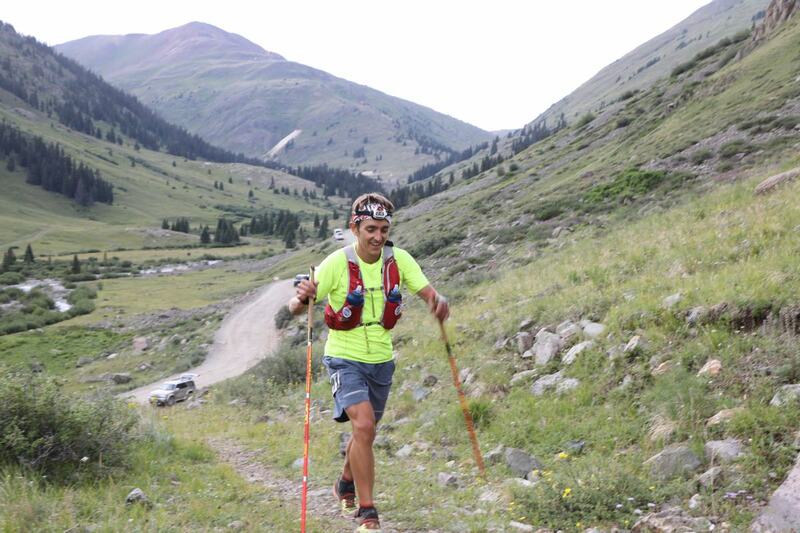 By 18 miles into the race, Rome was courting with the men’s top 10 and, at Telluride, mile 28, he settled into seventh position, the same position he finished in 2017 and a position he’d hold until after mile 58. And, then, the magic started happening as he moved up from seventh to third in the 27 miles that followed. He, too, was surprised to arrive to Cunningham and find out that, not only was he in second place, but he was also just a few minutes off the lead. He went up the final climb chasing Jeff Browning as hard as he could. In the end, the two Jeffs maintained their order, with Jeff Browning as the men’s champion and Jeff Rome in second place, a huge step up from his original goal. Troy Howard (pre-race interview) is slowly filling out all the finishing positions at the front of Hardrock. He came into this year’s race with two prior second-place finishes and a fifth, too. In a cursory way, Howard’s and Rome’s early races went similarly with Howard also occupying space in the back half of the men’s top 10 before moving forward in the rankings as the race went on. Grouse Gulch, the mile 58 aid station, seemed to serve as a hinge point between the first half of Howard’s race and its second half. There, he arrived in sixth place, but transitioned in and out of the aid station faster than a whole bunch of people, leaving in third. From there until after mile 72, Howard held that spot, though after that he was passed by Jeff Rome and was running in fourth place. After Thévenard’s disqualification, he moved up into and stayed in podium position until the finish. Another Hardrock paced hardrock solid from start to finish for Howard. Benjamin Bucklin and Jesse Haynes took fourth and fifth, respectively. Notable among the rest of the men’s field, Blake Wood earned his 22nd finish, and Kirk Apt took home number 24. Let’s tell it how it is: this race was the Sabrina Stanley (pre- and post-race interviews) show from start to finish. Stanley went immediately to the front of the women’s race, crossing Mineral Creek at mile 2 ahead of the other women. From here to about mile 28, Stanley ran just a couple minutes in front, such that the ladies caught sight of each other from time to time. 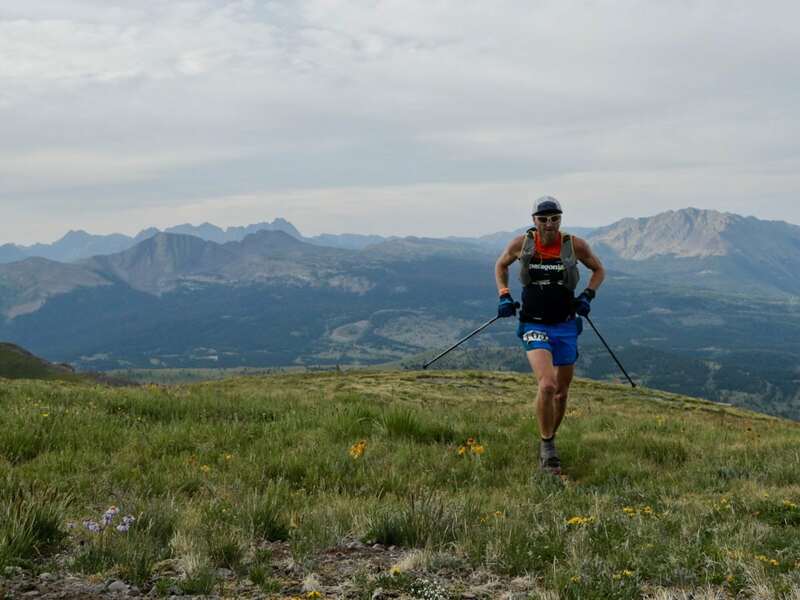 Stanley said after that the race that catching sight of another woman behind her at the Chapman Gulch aid station, mile 18, encouraged her to put a strong effort on the climb out of the gulch. 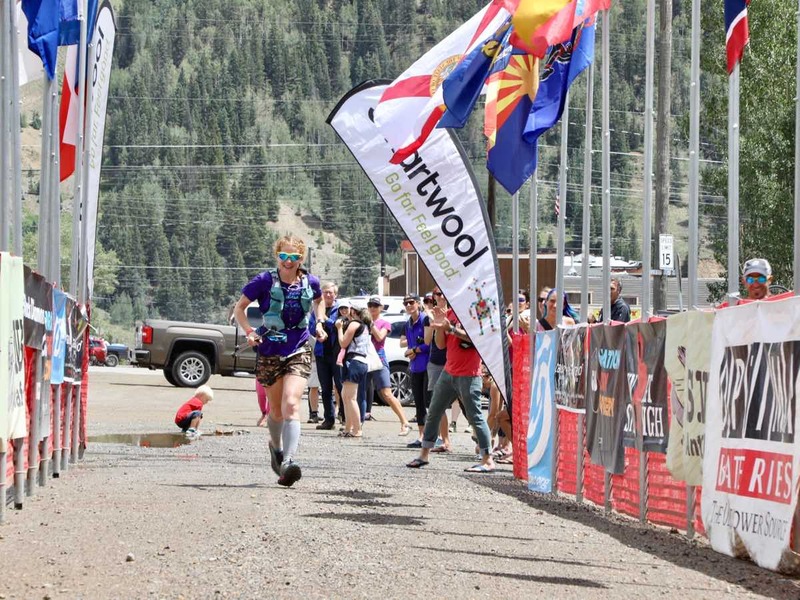 From Telluride, mile 28, to Ouray, mile 44, Stanley more than doubled her lead and arrived with an almost-half-hour gap. 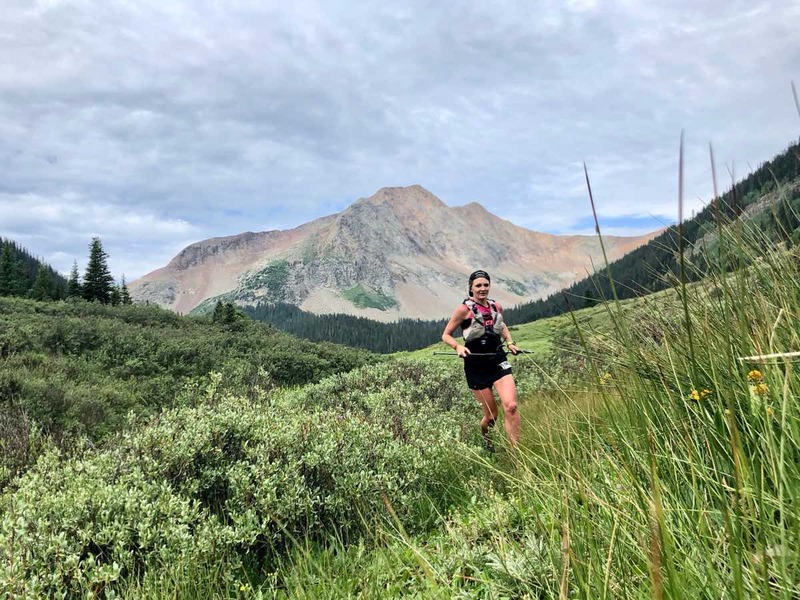 However, though she always remained handily in front of the women’s field, the gap between she and second place shrunk to 13 minutes again at Grouse Gulch, mile 58. But then the rest was really history, as at every location from which we reported from there to the finish, Stanley increased her gap on second place and her win was by 55 minutes. Immediately at the finish and resoundingly the day after too, Stanley stated she intended to use the entry into next year’s race that she earned by winning. Steady as she goes, Nikki Kimball (pre- and post-race interviews) took second place in her Hardrock debut, though she and third-place Darla Askew (post-race interview) leap frogged each other a couple times as far as we observed, and who knows how many others, before their ultimate two-three finish. At mile 7, atop the first climb of the race, Askew and Kimball ran together, though Kimball would gap Askew on the long downhill to the KT aid station at mile 11.5. From that point until after Telluride, mile 28, Kimball ran a few minutes ahead of Askew. 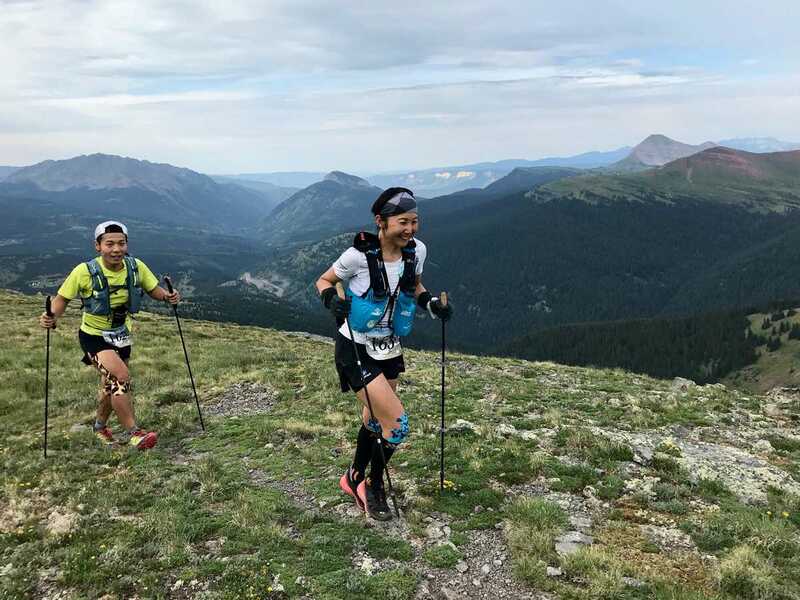 The pair flip-flopped again on the climb up after Telluride, with Askew arriving to the famous Kroger’s Canteen aid station, mile 33, up above 13,000 feet elevation, in second again. Askew maintained that second-place position until somewhere after Sherman aid station, mile 72. 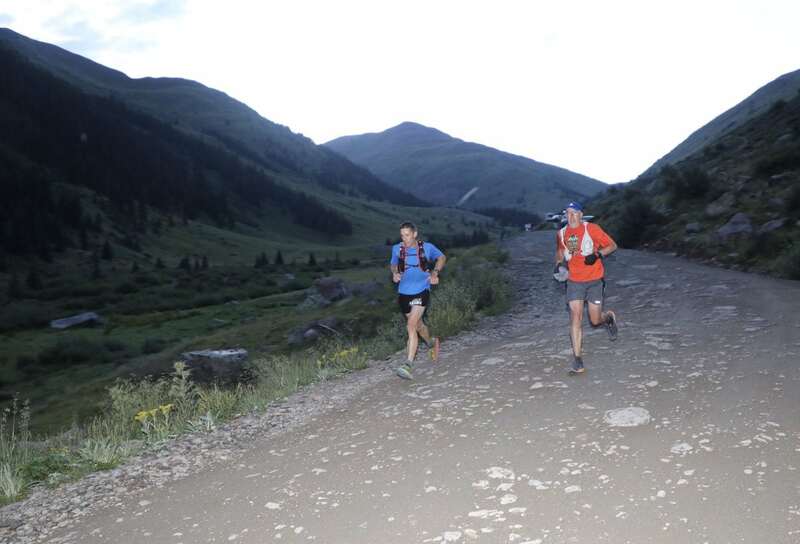 When we next saw the duo at Maggie Gulch aid station, mile 85, Kimball had put 14 minutes on Askew, and the pair would complete the journey back to the start/finish in Silverton in this order. Make that six finishes now for Askew! Japan’s Kaori Niwa (pre-race interview) took fourth and Lise Plantier rounded out the women’s top five. Notable among the women’s race, 11 of the 14 women who started finished. Liz Bauer hit the 10-finish mark, Betsy Nye her 16th, and and Betsy Kalmeyer her 19th. We are a big team of volunteers who worked a couple hundred hours total to bring you our Hardrock 100 coverage! Thanks so much to the members of this year’s coverage team, including Marissa Harris, Mauri Pagliacci, Kim Wrinkle, Kristin Zosel, Kurt Schilling, Ashley Saloga, Scout Phillips, Alex McGeorge, Roch Horton, Eric Senseman, Jacky Cooney, Charles Johnston, Eliza Hamm, Adam Schalit, Olivia Rissland, Adam Gerard, Vera Alves, and Steve Blackburn. 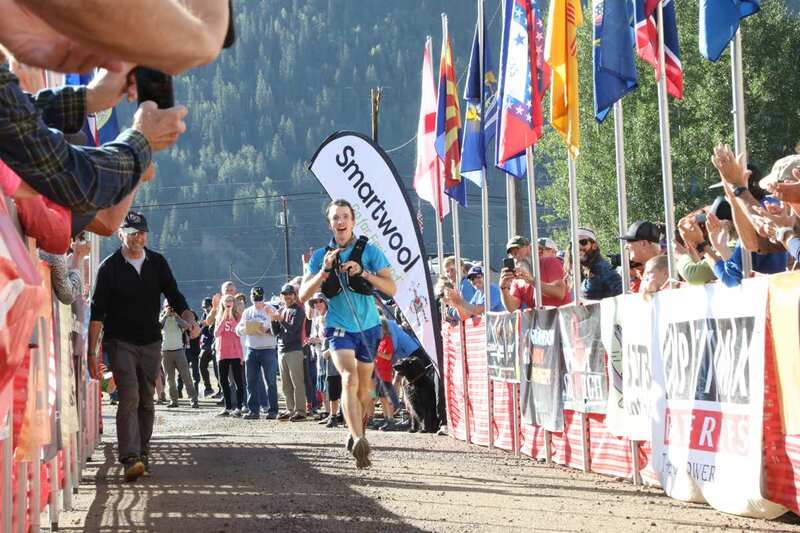 We recognize the contentious nature of Xavier Thévenard’s confirmed rules breach and the decision by the Hardrock 100 run organization to disqualify him. Thus, we expect that comments about it will be contentious, as well. We welcome discourse on iRunFar, but we require it to be civil and in adherence with our comment policy. Thank you. One solution is to to have no winner on the men’s side this year. This would recognize that Browning was truly second place and put the XT controversy in its place in HR history; it is also consistent with the “race” being called a “run.” Either way, this is a shame all the way around as Dale is a volunteer doing his best and XT paid a heavy price for his mistake– with cogent arguments on both sides of the issue.